Sprinkle the eggplant with ample salt on both sides and leave them for two hours. Rinse them and dry them well. Fry them in olive oil on middle high heat until they are brown on both sides. Put the eggplant slices together with the other ingredients and puree them with a fork or using a food processor. 13 March marks the beginning of the Siege of Khartoum in The Sudan. The battle was between the Egyptian army led by the British and the Sudanese Mahdists and lasted for almost a year. Click on culinary calendar for more links between cooking and history. Mix all ingredients and add salt and pepper to taste. Heat a good layer of oil in a frying plan. Make round cookies from the mixture with the help of a big spoon and fry these on both sides until golden brown, approximately 5 minutes. Serve with sour cream. 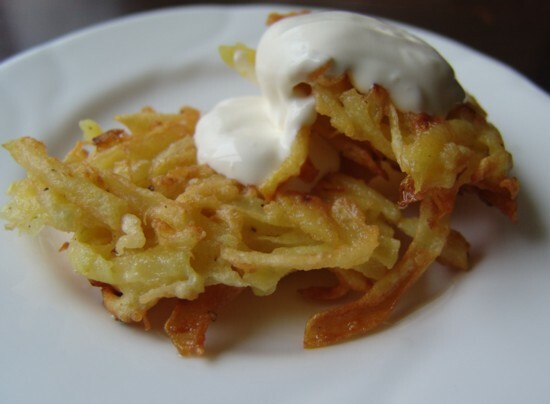 Latkes are served for Hanukkah, the festival of lights that takes place in December. On this day, dishes prepared in oil are served to remember that the menorah once burned 8 days on a quantity of oil only sufficient for one day. On 26 February 1829, Levi Strauss was born, the founder of the blue jeans company. His real name was L�b Strauss, a German-Jewish immigrant into the USA. He came from Bavaria and became a US citizen in 1853. Click on culinary calendar for more links between cooking and history.